Wade Bourne, a longtime fishing and outdoor writer and broadcaster and founder and host of Wired2Fish/Hunt Radio, received the Homer Circle Fishing Communicator Award. ORLANDO, Fla. — The Professional Outdoor Media Association and the American Sportfishing Association’s Homer Circle Fishing Communicator Award was presented here on Tuesday to outdoor writer and broadcaster Wade Bourne. “I can’t imagine a more fulfilling career than covering fishing, boating, hunting and other outdoor pursuits,” Bourne, 69, of Clarksville, Tenn., told a crowd of about 75 people prior to a preview of the New Product Showcase at ICAST (the International Convention of Allied Sportfishing Trades). 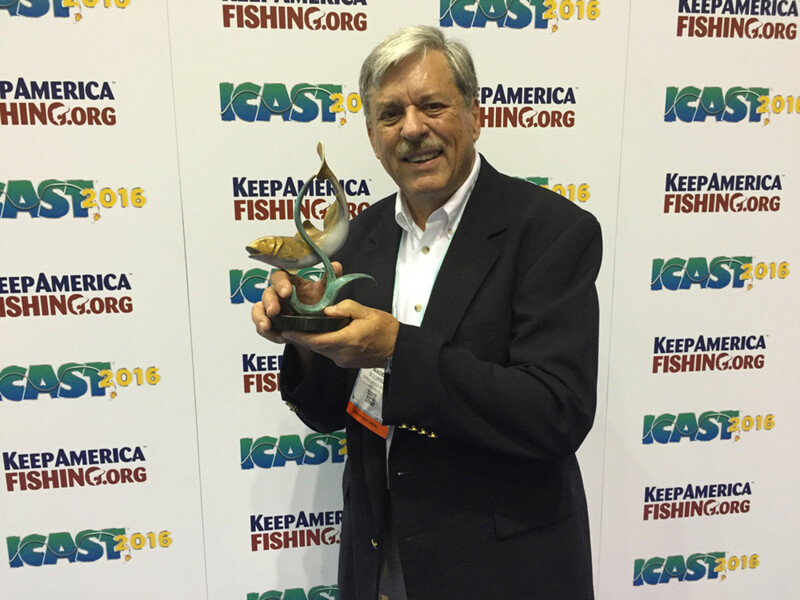 The POMA/ASA Homer Circle Fishing Communicator Award recognizes a journalist who exemplifies the spirit, dedication to fishing, extraordinary talent and commitment to mentoring the next generation of sportfishing communicators, as displayed by outdoor journalist legend Homer Circle. POMA is a professional association representing the traditional outdoor sports media. Bourne is the founder and host of Wired2Fish/Hunt Radio, a syndicated fishing/hunting radio program that airs year-round throughout the country on about 280 stations. Bourne is also editor-at-large for Ducks Unlimited Magazine and senior writer for Bassmaster Magazine, where he has written a column since the 1970s, he said. Bourne has hosted/co-hosted Ducks Unlimited TV (Outdoor Channel, Pursuit Channel) during the past 10 years. He has had more than 3,000 articles published in outdoor magazines. He is the author of six books. 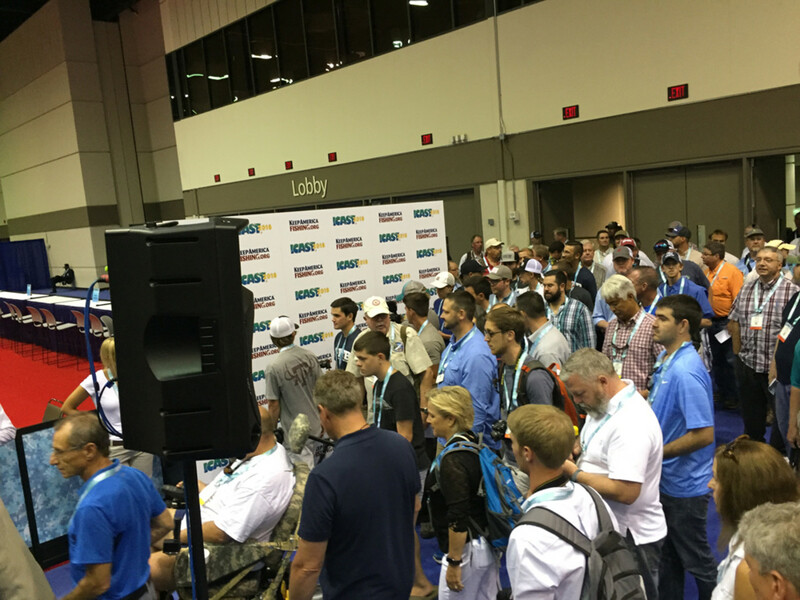 Media members flooded into a display area on Tuesday to check out the new fishing equipment from ICAST exhibitors during a preview of the New Product Showcase. The award was presented moments before a preview of one of ICAST’s most popular components — the New Product Showcase. More than 1,050 products were on display, covering the areas of fishing rods and reels, tackle, lures, footwear, lifestyle apparel, boating accessories, electronics, kids’ tackle and more. Media will vote on their choices for the top products, and awards will be given before the end of the show.